He handed me his card. Vexillology is the study of flag symbolism. I was on my way to the Oakland Women’s March carrying a large American flag that I had handmade several years ago. I’d never taken it out of my studio. 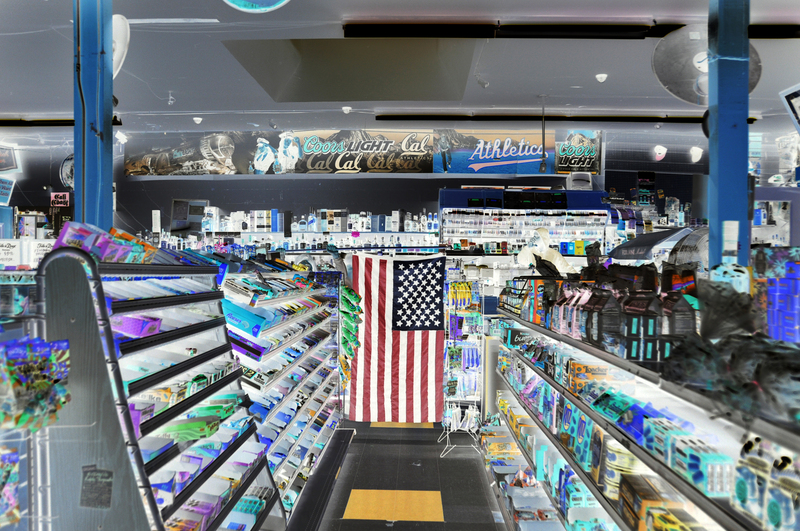 The flag is regulation-sized (3×5 feet) and totally official, except that I reversed the colors: the blue star field turned light yellow, red turned turquoise, and white turned black. The inverse U.S. flag is a classic optical illusion, and I’d first come across it in a book of visual tricks. It’s used to demonstrate the concept of an after-image produced by retinal fatigue, where staring at something for several minutes without moving the eyes, and then looking at a white wall, will create a glowing ghost of the original image with its colors reversed. I made the flag in 2010 for a photo-booth-style event at my studio/gallery Smokey’s Tangle in honor of Independence Day. I easily found a pattern on the internet, circumventing a generation of flag sewing secrets, and sourced precise colors of sturdy cotton canvas at San Francisco’s legendary Britex Fabrics. Upon returning with a nausea-inducing $140 in fabric, and rusty sewing skills, I proceeded to jump in with both feet to a project that was far above my ability level. I worked as fast as I could, but an hour before the July 4th-related photo booth event, half of the star field was still uncut. We quickly revised the concept to a “sewing the flag” photo booth. We took a few dozen photos of people who came by that day, and inverted their faces into alien-like “Portraits of Patriots”. I finished the flag a few days later, and it hung on my studio wall: a hard-won prized possession. In the years that followed, I discovered I hadn’t been the first to artistically represent the inverted American flag–Jasper Johns created the lithograph “Flag (Moratorium)” at the height of the Vietnam war. My flag hung, as if dormant, for years. In January of 2017, I affixed the flag to a flagpole and took it out into the world. The historic Women’s March on Washington–and on pretty much every other major city in the country–inspired me to bring it out into the wider world: a field trip for a conversation piece. En route to the march. Top: unaltered photo. 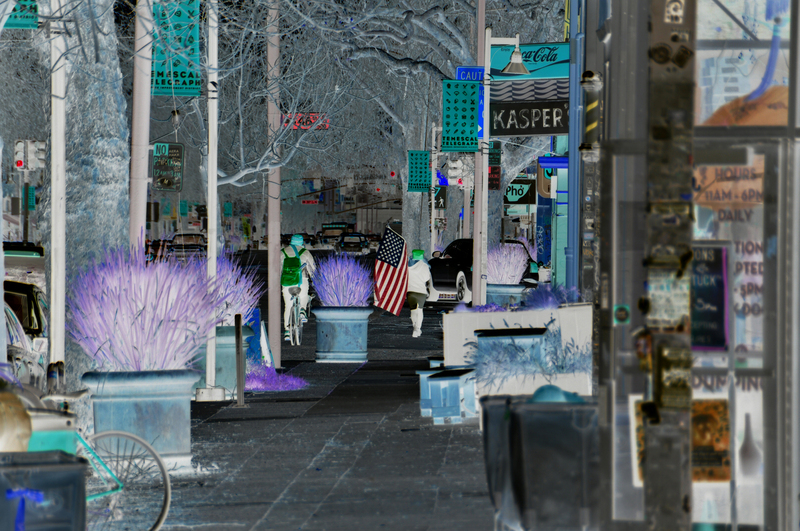 Bottom: colors inverted, as in a photographic negative. I didn’t even make it to the BART train station before two people stopped me: one to excitedly say she loved it, and a man to–in a confrontational manner–ask me, “Is this flag in support of the United States?” Slightly taken aback, I read his intentions and instinctively said yes. I explained the after-images; the negative photo in which “only the flag would be normal and everything else would be reversed”. It would be the first of over a dozen conversations I’d have with strangers at the march. Photo by Thea Walsh. Note how my favorite dress–a Peggy Noland original–works in reverse. 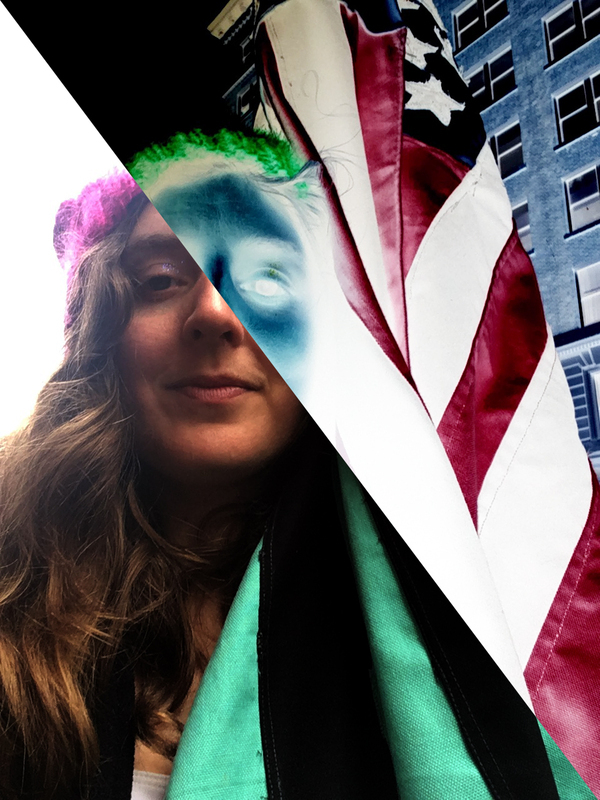 On the train platform, on the train, and all along the march–40 blocks packed with people, totaling nearly a hundred thousand–I was tapped on the shoulder and questioned as to the symbol, the meaning, the significance of the flag. I explained to questioners of all walks of life that it was as simply a perceptual trick meant to be surprising and thought-provoking. I’ve always loved optical illusions, and I liked imagining the real flag as a glowing after-image; a secret layer hidden in such a real, tangible canvas. The flag was physically heavy. I had to hold it above my head to keep from hitting people in the face, a feat at which I didn’t always succeed. But it was exciting to be able to represent my country in a way that was both classic and unusual. 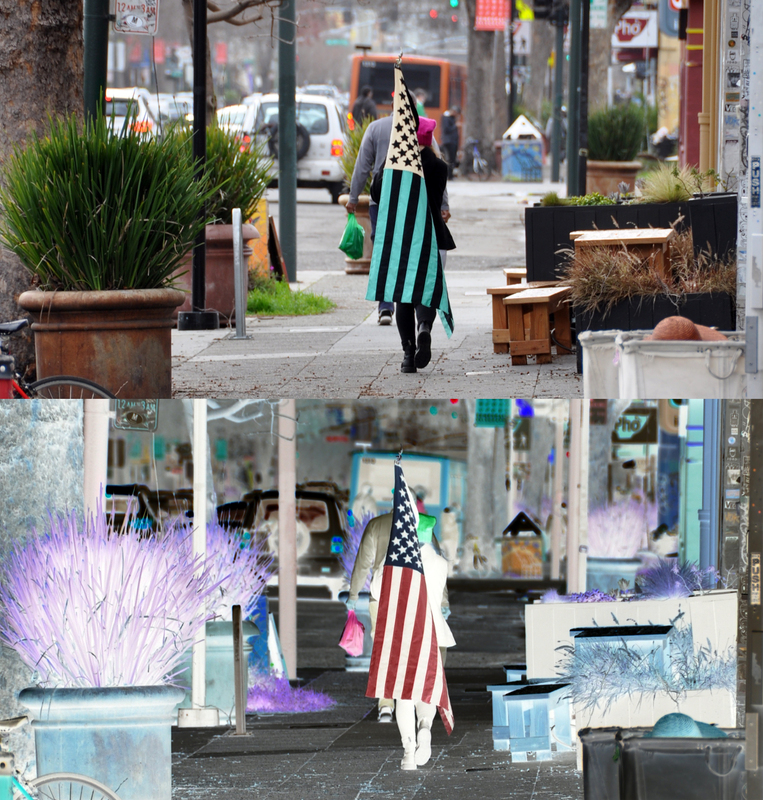 I returned home and inverted the photos I had of the flag, and to explore further what it meant to me. The new world that sprung up around photos of the flag, with darkened skies and white vegetation, had a nearly apocalyptic feel. 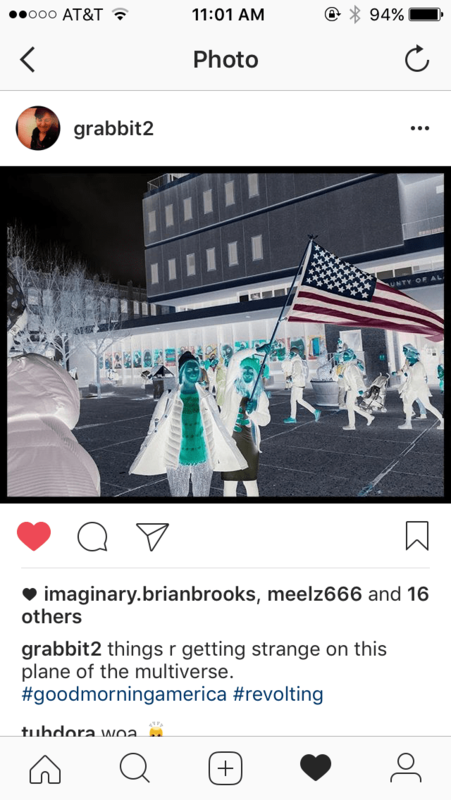 I half-joked on Instagram about “our creepy new world” and my friend Gaby posted an inverted a picture from the march the next morning, titling it “things r getting strange on this plane of the multiverse”. The unsettling nature of familiar things turned upside down, yet the flag persisting in its midst, reminded me of the line in our national anthem that used to choke me up when I was a little girl: “and the rockets’ red glare/the bombs bursting in air/gave proof in the night/ that our flag was still there”. I’d imagined what it would be like to watch the sky and see, fleetingly, that in the midst of everything falling apart around me, that the thing I was fighting for, still existed. All photos by Emily Wick and Brian Brooks unless otherwise noted. See also: Inverse Universe portfolio page.